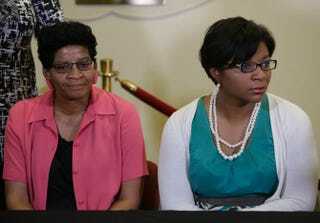 The mother of Sandra Bland, Geneva Reed-Veal, and sister Sharon Cooper attend a news conference at DuPage African Methodist Episcopal Church July 22, 2015, in Lisle, Ill., July 21, 2015. It was a "bittersweet" moment for the sister of Sandra Bland when it was announced that the arresting officer, Texas State Trooper Brian Encinia, would face charges of perjury in the case that ultimately left Bland dead from a reported suicide, the Associated Press reports. According to Sharon Cooper, the charge is long-overdue, but it's nothing compared to the loss the family suffered. Bland's case sparked nationwide attention after she was found dead, hanging in her jail cell, three days after being arrested following what was supposed to be a routine traffic stop. Cooper pointed out that her sister's case was "largely impacted" by the stop with Encinia. "It could have easily been avoided," Cooper said. Encinia was indicted Wednesday, accused of lying in an affidavit that Bland was "combative and uncooperative" during a July traffic stop. Hours after the news, the Texas Department of Public Safety announced that it would "begin termination proceedings" against Encinia, who has been on paid desk duty since Bland's death. If convicted, Encinia could face up to one year in jail and a $4,000 fine. Cannon Lambert, an attorney for Bland's family, told AP that Encinia should also have been indicted for assault, battery or abuse of his power. "The public deserves accountability," Lambert said. "If you don't have public accountability, you don't have public trust. I want the public to be able to trust the police." Bland's family, which has filed a civil rights lawsuit, claiming wrongful death, is waiting for authorities to turn over investigation records and allow Encinia and others to be deposed, the newswire notes. "Our family's grieving process is at a standstill," Cooper said.